**Unlimited API access is currently available as an add-on for users with a Pro level subscription. If you would like to subscribe to Pro, you can do so in your subscription settings at Admin > Settings > Subscription and Billing. Please visit the Disqus Data Platform to learn more about the web's largest first party data set. The chart indicates mandatory and optional relationships, as well as the direction in which you can find this information. For example, you can see that a reply post must have a parent, and you can find that parent from the reply post. However, you cannot find a child using the parent. A user in Disqus is one of the anchor points with which to obtain data. 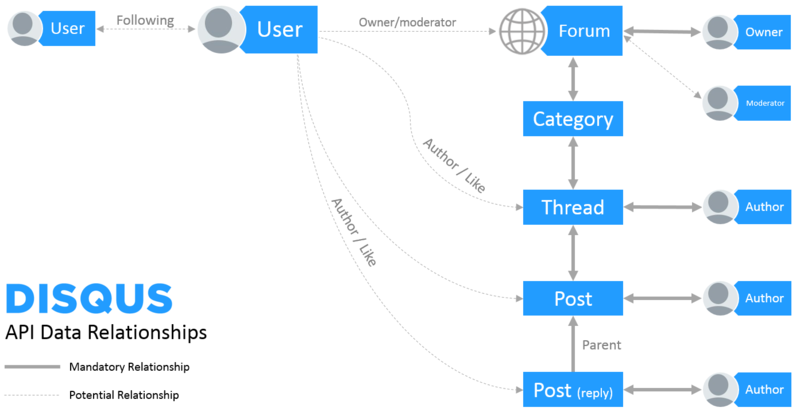 As you can see in the chart, a user can own or moderate a forum, can be the author/liker/voter of a thread or a post. There's also the relationship between the user and their followers/following. However, a user might not have any relationships, since it's an entity which can stand on its own. A forum is the second primary anchor point for data relationships. A forum must have an owner who is a user, and might also have moderators who are also users. A forum will also have at least one category, even if just the default one. Additionally, all threads, participating users, and posts can be found within the context of the forum, if there are any. Categories offer an intermediate bond between a forum and a thread. Knowing the category will allow you to find any thread under it as well as the forum it belongs to. A thread is a core discussion thread (group of posts), typically used to cover a particular article, post or topic on a website. This is represented by the Disqus embed. Each thread has a mandatory relationship to an author (who is a user), a category, a forum. If any posts are present, that relationship becomes guaranteed as well. A post (a.k.a. a comment) exhibits several relationships. There is the author of the comment, who must be a user, as well as the thread, category, and forum that they were posted under. If the post is a reply to another, you can find that parent post as well, but it doesn't work the other way around.